Toga? Nay! This is not some simple toga, citizen! These are robes befitting an emperor...the emperor. Julius Caesar himself! Old Jules was quite the man. Orator. Aristocrat. Emperor of the known world (or at least what part of the world the Romans knew). Military strategist with some crazy military prowess! We get why you might want to emulate him. Who wouldn't? The man controlled most of Europe. He was not to be trifled with. Now if you want to step into the sandals of our dear Julius, you might have a little work to do. We don't recommend killing pirates who've kidnapped you, or taking over armies (let alone marching across Europe with them), but you could most definitely start acting the part. Stand a little straighter. Speak with authority. Have a commanding presence. And of course, you could dress the part. 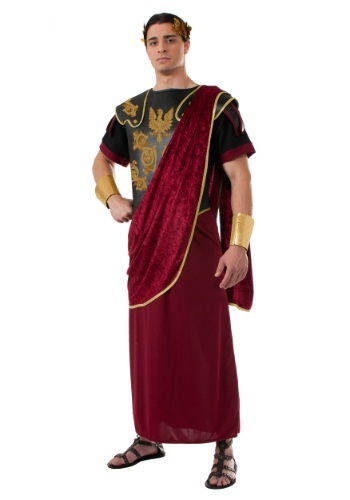 This is why our Julius Caesar Costume could not simply be a fancy toga. Yes, it has a fancy velvet shoulder drape (befitting a ruler), but this outfit comes with a laurel headband. Gold colored wrist cuffs. Did you note the attached breastplate? (Emperors have enemies you know, best to be prepared for anything.) This Julius Caesar costume would have you proudly attired and prepared for any gladiatorial games in your honor. What say you? This costume worth the thumbs up?